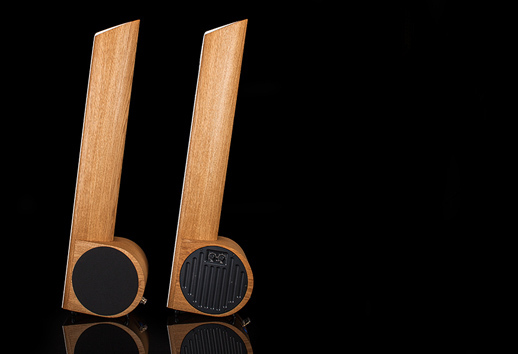 vo Sparidaens, Concept Manager, and Paul Rassin, Marketing & Communications Manager, are members of a six person team of a Dutch company Aequo Audio that designed Enesis loudspeakers. It's the only product of this manufacturer (for now). Introduction of these loudspeakers to the market was preceded with five years of research, trials and errors and new takes on the subject. The work was based on some technical assumptions, but the final voicing was made by a group of people, including designers themselves, and a group of friends - audiophiles and music lovers, who spent countless hours in listening sessions. 1. 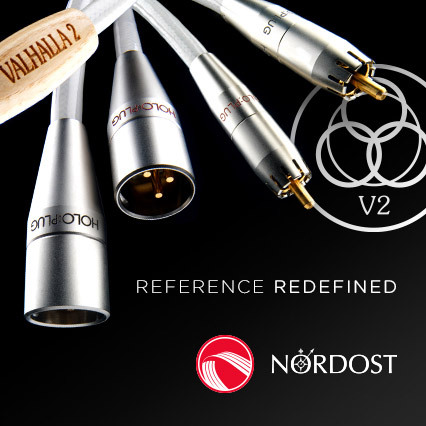 Size and form – an audio product should be beautiful and become a harmonious part of the environment it is placed in – yet, uncompromising when it comes to sound quality. 2. Room acoustics – Aequo Audio uses advanced measurement techniques, including excellent anechoic chamber, but it is only a starting point; it was not about achieving a perfectly flat frequency response in the laboratory conditions, but about adjusting it to the realistic acoustic conditions of any space used by music lovers. Adjusting the sound to a specific room is achieved using the ARPEC system: Adjustable Room (and) Extension Placement Controller and the techniques that assist a controlled sound dispersion. Tweeter. On the left it is shown, how does the classic "waveguide" work in the vertical position. The problem is reflection from the ceiling, but unfortunately the reflections from the floor are even more difficult to control, since the distance from the floor is shorter than the one from the ceiling. On the right you can see that a better balance between the reflections from the floor and the ceiling was achieved by tilting the cabinet of the loudspeaker to the back. 3. Soundstage and imaging – the way of recreating soundstage is one of the key factors towards creating a high-end sound. 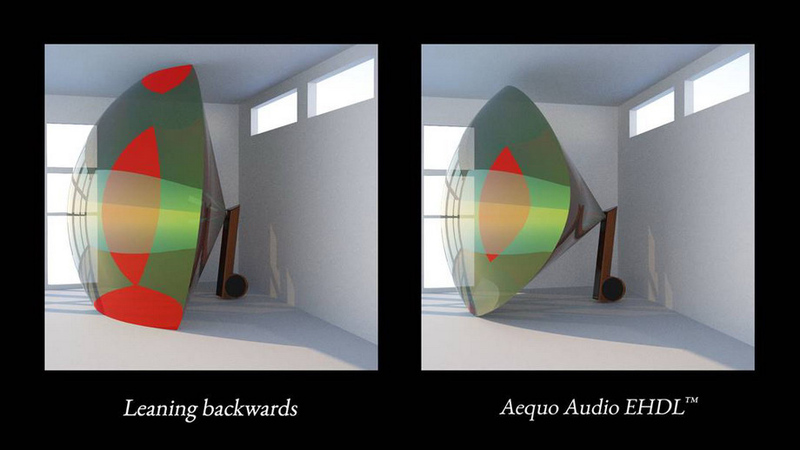 One of the objectives was to make these loudspeakers "disappear" from the room and the other to achieve such level of imaging of instruments and performers that would create an impression of a live performance. EHDL Waveguide: On the left there is a loudspeaker with a front baffle tilted back. On the right you can see the EHDL that converts part of the vertical sound energy into horizontal one, hence reducing the problematic reflections from floor and ceiling, and generating a much more realistic soundstage with better depth with more natural imaging. 4. Loudspeakers placement – the company tried to avoid the use of techniques that narrow possibilities of loudspeakers placement in the room, such as: bass-reflex or dipole sound radiation. 5. Purity - because one of the characteristics of the human hearing is high sensitivity to even extremely low distortion, one should aim to minimize them. However, one has to know what to look for and which of THD (Total Harmonic Distortion) are more important and which are less. The company assumed that in the frequency range to which we are particularly sensitive, one needs to find a balance between odd and even harmonics. To minimize distortion a special multi-layer cabinets were created, a hi-tech midrange driver, and a special attention was paid to put all the elements perfectly together. Midrange driver measurements: The driver developed by AA delivers amazingly clean and fast performance. It does not have a problem with the "ringing" from the membrane break-in, which allowed them to use low-order filters in a crossover. This is achieved by symmetrical motor system and a special PP membrane with perfectly damped own resonances. Hence it was possible to use a low-loss suspension, thereby reducing the compression. 6. Precision - the resolution and phase behavior of the loudspeakers is another aspect that was important for the people of AA. Omission of bass-reflex and steep crossover filters allowed to bypass the problem of group delay phase in different parts of the band. It was also important to use transducers, which, thanks to the construction of the motor system were able to respond quickly and without compression. 8. Dynamics – some loudspeakers deliver a dynamic performance at low sound levels, other at high ones, which usually is a result of drivers chosen for particular design and their implementation. Audio Aequo tried to match these elements in such a way that dynamics and thus the emotional connection between a listener and music was similar at any position of volume knob. On the first day back in the rainy Netherlands, we look back at a very pleasant visit to Poland. I am very happy to have meet you in person and want to thank you again for inviting us in your house. I am very impressed by your vast music collection with real special gems, and your passion for both music recordings as well as state of the art audio equipment. 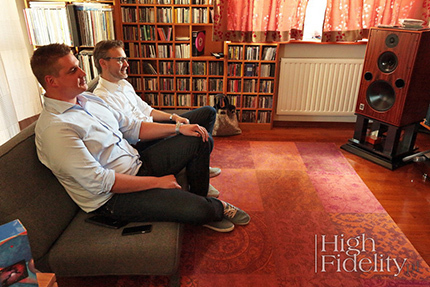 Ivo Sparidaens - Concept Manager – oraz Paul Rassin - Marketing & Communications Manager during listening session with reference system of „High Fidelity”, Harbeth M40.1 including. To prepare the speakers for the test the midbass and subwoofer drivers have been burnt in by a multi-frequency sine-sweep to x-max for a fixed time lapse, as we always do before taking measurements. The tweeter has not been truly burnt in yet, as we feel it’s better to play them in with music. Depending on music and listening level, you can expect around 3 days for the tweeter to get adjusted to its job and get the best natural performance. It is possible that you experience the subwoofer and midbass also loosen up a little more in these days. As we stated during our visit you received a finished product for your review, although we still plan to introduce a few minor changes. We are still waiting for the final amplifier to arrive and we need to finish our auto standby circuitry. We also await the CE certification and finalizing product manual – your test will take place before we even start to deliver our product to customers. We hope these information will be useful for your review. If you have any questions don't hesitate to ask us – we'll be happy to answer any of them. Your opinion is very important to us. 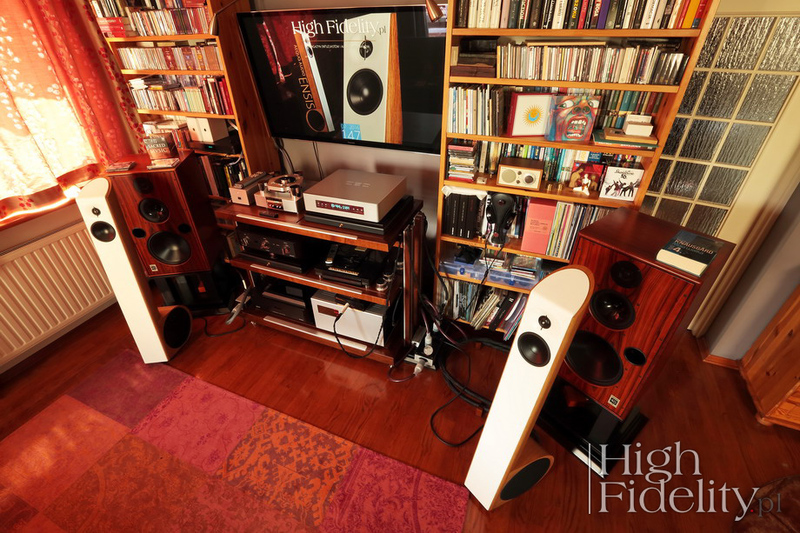 I think the speakers will perform very well in a similar position as your current Harbeth speakers, only with probably a bit less toe-in. Ensis is a three-way semi-active loudspeaker, with a soft dome tweeter and a very costly, custom made by Audio Technology midrange driver. Mr. Ejvind Skaaning and his son, Pera Skaaning are owners of this company. In the past Mr. Ejvind founded and for many years led Dynaudio and Scan Speak. Drivers sit in a narrow, rounded at the back enclosure, quite high up above floor level, and the front baffle is slightly tilted towards the back. The cabinet is made of several layers of wood of different density with a vibration damping material placed between the layers. Speakers feature an active bass section – a side-firing woofer is placed in a sealed enclosure. During the test, the speakers were positioned with woofers firing outwards. Woofer is driven by a class D amplifier. The adjustment can be performed using two knobs, one of which adjusts the level of the sound and the second the cut-off point – it is a so-called analog ARPEC system. From our conversation it was clear that people from AA do not like digital DSPs that introduce unpleasant sound coloration, hence Ensis are completely analog loudspeakers (class D amplifier is also of an analog kind). The bass module is powered from the power grid. Set includes two thick, but quite ordinary power cables. Replacing them with other chords might be problematic though, as manufacturer instead of IEC connector used Neutrik's PowerCon ones, with silver contact areas. In subsequent versions they plan to use the same type of connector but made by Amphenol, which - as Ivo said - are of much higher quality. Signal from amplifier should be delivered to a single pair of speaker terminals and there is no separate low-level one for the bass - hallelujah! Similar solutions can be found in other high-end semi-active designs such as Audio Machina, for example. For the test loudspeakers were placed in exactly the same spots as my own Harbeths. While assessing them I firstly listened to the same albums I presented to Ivo and Paul. For this test as a source I used a two-box CD Player with CEC TX0 DAC0 3.0 + 3.0 (test will be published next month). The rest of the system was same as always. Adjusting the settings in the bass section took me ten minutes - it is simple, and the effects of the changes are clear.